People around me understood so well my obsession toward dessert. Or maybe just my crave for food in general. I developed this 'lusty' habit since I was in primary school. At that time, I was attending Chinese school. As a Muslim student being in Chinese surrounding, I was pretty much left with very few option when it came to breakfast or lunch. 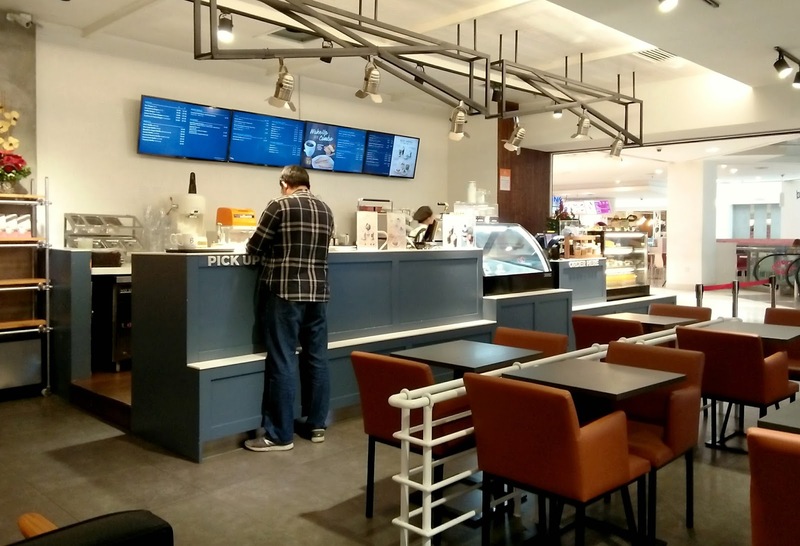 The only menu in the canteen that I could choose, was either desserts or bakeries. It was much sadder than it sounds like. Every day when the recess bell rang, I would make my way to the dessert corner and forced myself to buy any bread or cake, which seemed to be less bland, and pushed it down my throat. To make it easier, I would train myself to like it. Everything is in your head, they said. And just like that, I spent most of my days up until final year of high school, eating nothing much more than desserts or breads. But hey, at least I can tell people that I've been loving desserts for more than 10 years now. Now let's talk about the main point, shall we? 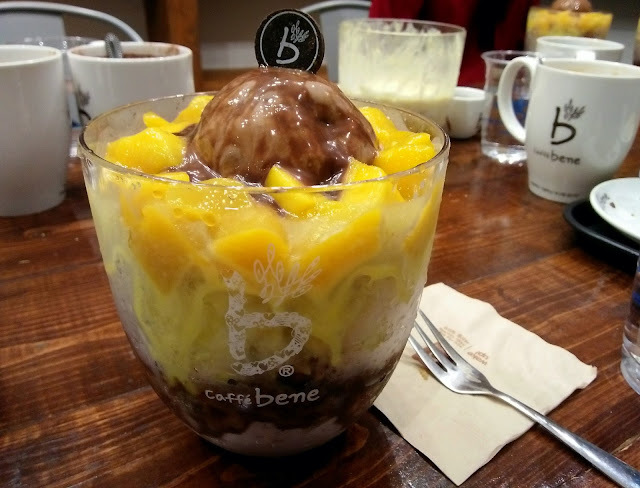 Caffe Bene, a korean-style dessert corner which specialized in serving icy Bingsu and hot coffees. I don't really go for the mainstream, but I believe the influence of Korean culture has been around for over half a decade now. So if you're really into this K-culture and stuff, you might actually fall for this place. 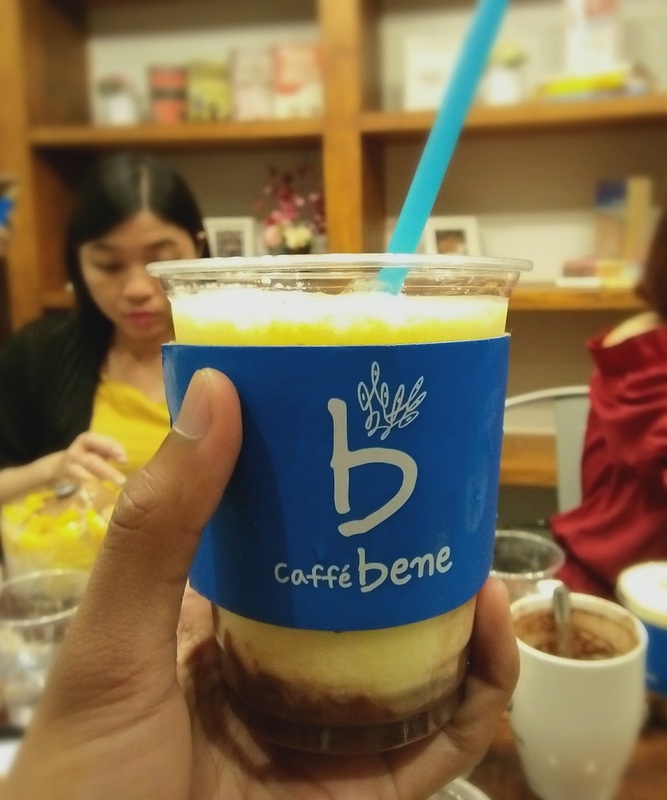 Just any other Japanese restaurant, Cafe Bene greets its customer with a friendly line of 'annyeonghaseyo', and bid its 'kamsahamnida' when you leave. Cafe Bene normally comes out with a theme of promotion of each season (perhaps something Malaysians aren't so familiar). A flavor or a new creation would be displayed and sold only for that particular quarter of the year. So for summer 2017, they came out if a combination flavor of mango and Nutella. They call it 'Mangotella'. 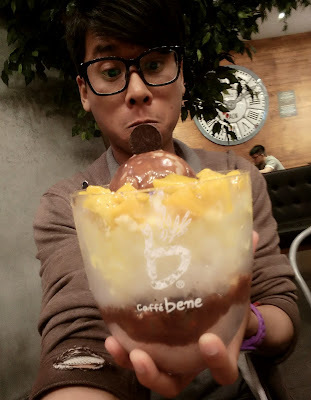 That huge cup I'm holding on the left photo is called 'Mangotella Bingsu'. 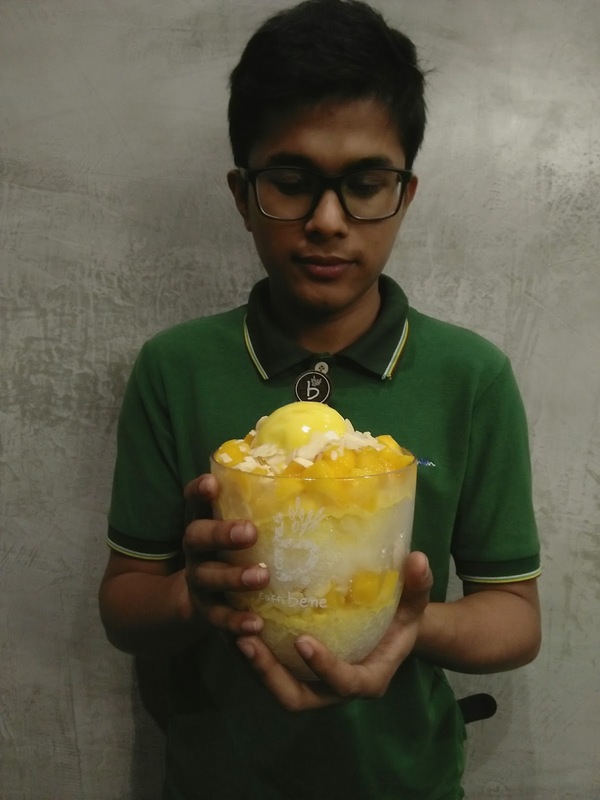 While the one that my twin's holding is called 'Mango Yogurt Bingsu'. Both of them are served pretty similar, with chunky mango cubes in double-sized cup. The only difference is they are filled with Nutella gelato and yogurt gelato respectively. Each of them cost RM 29.90. I know some of my reader know that I'm a sucker for cheap food, but trust me, with that size of a cup, it is enough to feed 3 people. You might even have some left-over. Eating ice cup alone can't possibly be enough, right? So, me and my cousin had these in additional - Mangotella Waffle & Mangotella Smoothie. 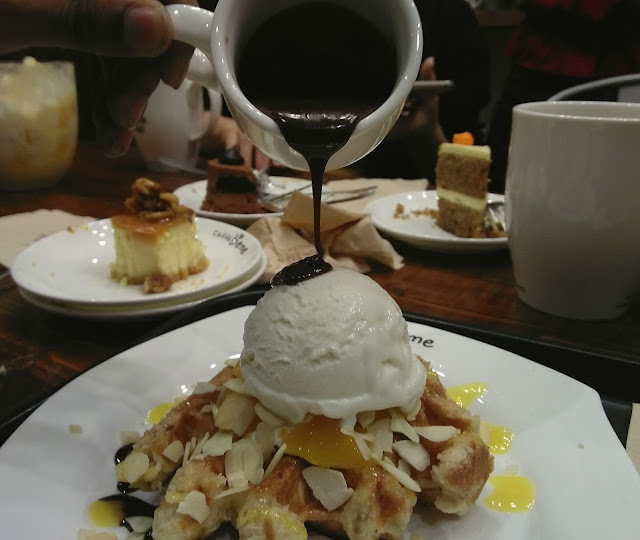 Hot Belgium waffle, also served chunky mango cubes and Nutella drizzle, and finally topped with yogurt gelato. Plainly rich in sweetness. As for the smoothie, it's a simple drink with the combination of mango and nutella. Both of them cost RM 17.90 and RM 11.90 respectively. Ow, before I forget, we also ordered this bread. I don't know why, but I was so in love with the taste of it. Honey bread, served with garlic cheese sauce. We had it for appetizer, but it was quite big too., enough for the two of us. 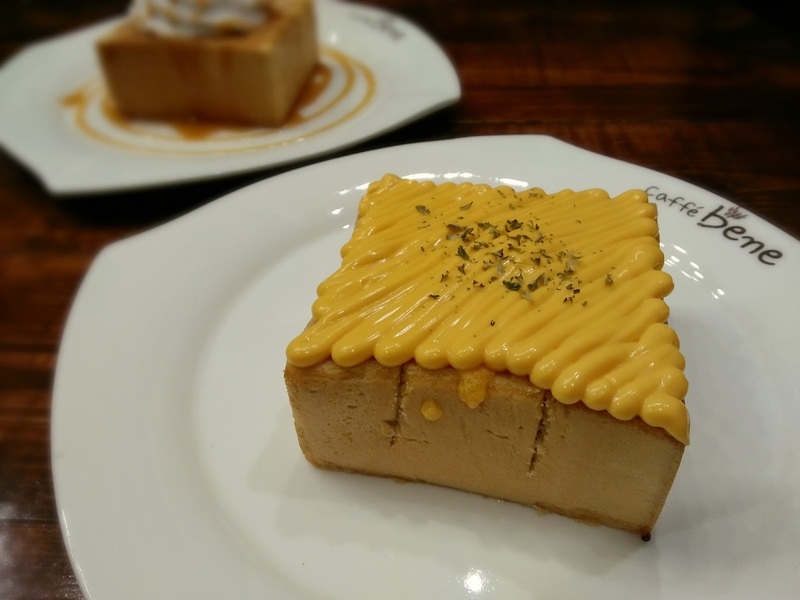 Next time when you're in City Square JB, or maybe on the way to go to Singapore, stop by and relax a little. The surrounding was pretty nice. Here are some link for you guys.